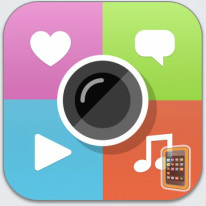 ThingLink - All about apps in YOUR classroom! Thinglink.com and the ThingLink app are free and user -friendly digital tools that provided users the ability to turn any image into an interactive graphic. The web tool and the app allow for teachers and students to provide information in a visual format. You can upload images from your hard drive, import from flicker or the web when using the website. In the app, you can import images from your camera roll or take a photo. Then simply add tags to the images. The tags could be audio, website, or video. Choose the icon you want to associate with the tag and add a short description. You can create these multiple “hot spots” on specific parts of the image. You can easily embed an interactive ThingLink graphic into any blog or website. This tool allows users to pack a lot of content into a small space. When you create a free account, this tool allows you to view a gallery of thinglinks other users have created. You have the option to bookmark the galleries you’ve viewed. The tools also pulls up related thinglinks it you might be interested in and lastly, you can also search for already created ThingLinks by topic. The Stream feature allows you follow a particular topic such as education. For ideas on ways to use ThingLink, please view Donna Baumbach’s collaborative Google Presentation, Ways to Use ThingLink in the Classroom.